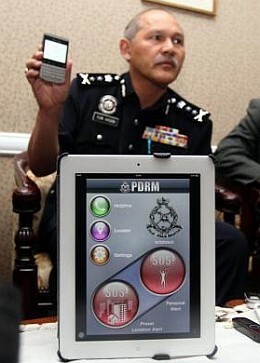 SHAH ALAM: Selangor police have launched an updated version of MyDistress, introducing an Emer­gency Contact function to allow police to alert the next-of-kin in an emergency. “There is also the Info-blast function in which users can access press releases issued by the police on crime cases in the state,” said Selangor police chief Deputy Comm Datuk Tun Hisan Hamzah. Another new feature of MyDis­tress Version 2.0 is the Message function, available in English, Ba­­ha­­sa Malaysia, Tamil and Chinese. “The function allows users to send text messages directly to the command centre in case of an emergency,” he said, adding that 98,681 people had downloaded the application so far. New and improved : DCP Tun Hisan showing the latest version of the MyDistress mobile application. Another feature is the Vehicle Profile function, which allows users to key in the licence plate number of a vehicle during an emergency. He said a new video function was also being developed and would be introduced with the next upgrade. Selangor police introduced MyDistress in August last year to provide people with an easy access when seeking help with just a tap on their smartphones. DCP Tun Hisan said police had responded to 69 crime cases and four traffic accidents since then while there were 77 “false alarms” when the SOS beacon was accidentally activated after it was installed. He also launched a new police vest, equipped with LED lights as well as the latest multi-coloured police siren lights which have been equipped on 80 police patrol cars in the state. Later in KUALA LUMPUR, In­­spec­tor General of Police Tan Sri Ismail Omar announced that hundreds of policemen from Bukit Aman had been deployed at shopping malls to conduct patrols in an effort to boost security. He said with the move, at least 300 policemen, from the rank of constable to superintendent, would be involved. “Depending on the business operations, more personnel would be deployed at the malls during peak periods such as weekends and public holidays,” Ismail said after attending a buka puasa event at the city police headquarters. He did not reveal the total number of malls that would be part of this NKRA crime reduction initiative but said they included shopping malls in the Brickfields and Damansara areas as well as The Curve shopping mall.